From DevX.com: In this article learn what Office 12 will mean for developers, particularly those who are creating commercial and enterprise apps. 906723 Error message when you try to open an Office 2003 file from an FTP site in Internet Explorer: "Could not open "
Understanding the Word Object Model from a Visual Studio 2005 Developer's Perspective Ken Getz on Visual Studio 2005. Learn how you can use objects provided by MS Word 2003 to create managed code solutions with Visual Studio 2005 Tools for Office. 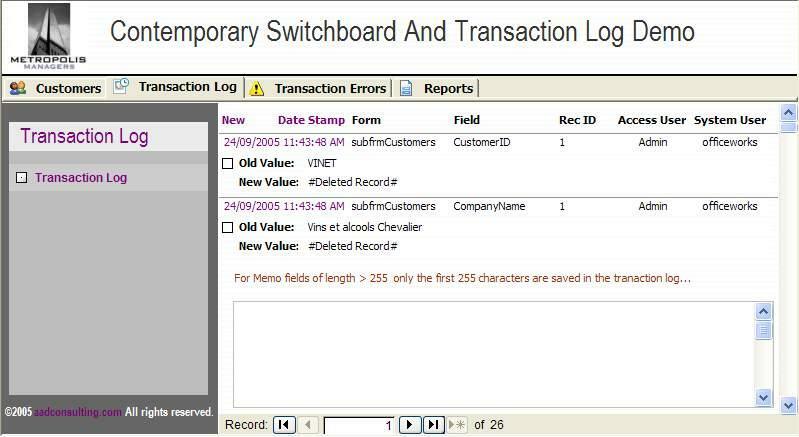 Code examples demonstrate how to work with Word 2003 applications and documents, and with important properties and methods. Excel 2002/2003 Add-in for SQL Server Analysis Services Quickly and easily access multidimensional data, perform in-depth analysis, and create flexible, interactive reports in Microsoft Excel. Use the Add-in to access and analyze multidimensional data and create interactive structured and free-form reports in Microsoft Office Excel. Easily access online analytical processing (OLAP) data, perform in-depth analysis, and create flexible reports using Microsoft Office Excel. Improve Business Performance with Powerful Analytics Learn more about the Excel Add-in for Analysis Services and how it can expedite decision making for your enterprise. Designing Reports with the Excel Add-in for SQL Server Analysis Services Read this white paper to learn how to design flexible free-form reports and structured reports using this add-in. 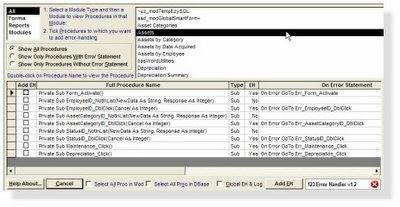 SQL Server Express is the replacement for MSDE, and its database engine is fully compatible with SQL Server 2005, so it is easier to migrate you Access ADP projects from SQL Server Express to SQL Server 2005. Plus it has a graphical query tool, which simplifies creating queries and managing SQL Server. Access guru and writer, Rick Dobson, has just published a book to get you started: Beginning SQL Server 2005 Express Database Applications with Visual Basic Express and Visual Web Developer Express. Microsoft Press has also released a book, Microsoft® Visual Basic® 2005 Express Edition: Build a Program Now!, which comes with a CD that includes Visual Basic 2005 Express Edition and Microsoft SQL Server 2005 Express Edition. From DevX.Com: Learn how to consolidate task data residing in various MS Office file types into a Microsoft Outlook Add-in. This article shows how you can begin to incorporate snippets of data included in Microsoft Office files into a meaningful solution. SQL Server 2005 Books Online (December 2005) Download an updated version of the documentation and tutorials for Microsoft SQL Server 2005. POS Connector for Microsoft Office Small Business Accounting 2006 and Microsoft Retail Management System The POS Connector for Microsoft Office Small Business Accounting 2006 allows small business retailers to connect Small Business Accounting to Microsoft Retail Management System. POS Connector for Microsoft Office Small Business Accounting 2006 and Microsoft Point of Sale The POS Connector for Microsoft Office Small Business Accounting 2006 allows small business retailers to connect Small Business Accounting to Microsoft Point of Sale. Visual Studio 2005 Tools for Office: Understanding the Word Object Model Sample This download contains Visual Basic and C# code examples of using the Microsoft Word object model in Visual Studio 2005 Tools for Office applications. Office 2003 Sample: Generating Active Directory Diagrams with Visio 2003 and Visual Studio .NET 2003 This code sample accompanies the MSDN article "Generating Active Directory Diagrams with Visio 2003 and Visual Studio .NET 2003." Office 2003 Add-in: Project Report Presentation The Project Report Presentation Add-in for Microsoft Office Project 2003 helps a user to quickly and easily create a Microsoft Office PowerPoint presentation containing user-selected task information from Microsoft Office Project. SQL Server 2005 Express Edition Documentation and Samples (December 2005) Download the Microsoft SQL Server 2005 Express Edition (SQL Server Express) Books Online and samples. SQL Server 2005 Samples and Sample Databases (December 2005) Download over 100 samples and three sample databases for SQL Server 2005. Visual Studio 2005 Tools for Microsoft Office Now Available Use .NET Framework version 2.0 to extend Microsoft Office 2003 Editions applications, such as Word, Excel and Outlook, using Visual Basic and Visual C#. Visual Studio 2005 Tools for Office Sample: Status Report Application for Word 2003 This download contains sample code for a Word Status Report solution developed in Visual Basic and C# with Microsoft Visual Studio 2005 Tools for the Microsoft Office System. My free Developer ToolPack for Microsoft® Access, which is listed at Microsoft's Office Marketplace, has been updated today with the Access Database Mechanic and Table Links and Connections Manager applets, coming out of Beta. Access Database Mechanic A tool that automates the process of attempting to recover a corrupt Microsoft Access database, using three operations: compact & repair, decompile, and complete rebuild of an .mdb. The applet also features a fail-safe mechanism that creates a uniquely named back-up copy of the .mdb before each recovery operation. Ezy Debug Simplify debugging in Microsoft Access 2000 and later. Ezy Debug is launched from the right-click popup menu in the code window of the VBA Editor. The applet provides quick access to the error-trapping settings in the code window, and once invoked it is available both in the Database and VBE windows. The current error-trapping setting is displayed and can be changed on the fly. Separate reports are produced for .mdx and .adx files. With full Find/Replace functionality and saving of customized font and Enter key settings. The two dependency views are integrated in the one treeview. For example, in the above screenshot, ODB displays not only the fields collection for the Customers table, but linked tables and joins, and all other objects in the database that depend on the Customers table. Clicking on a join field will show the related to table/field and the type of join. 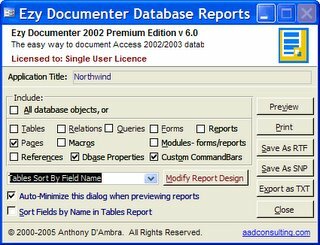 Ezy Documenter Premium Edition Automatically documents and prints in fully formatted Access reports all the objects in your Access database: tables and fields, table relations, query definitions, forms and record sources, reports and record sources, code modules, macros, data access pages, references, custom command bars, and database properties. The Premium Edition allows user customization of each Ezy Documenter Database Report. Reports can be exported in varied formats. 123 Error Handler Wizard Instantly add error-handling to your databases: 1. The Wizard reviews your database and identifies all procedures without error-handling, and reports the On Error... statement for all other procedures. 2. You select which procedures to add error-handling. 3. The Wizard adds error-handling to the selected procedures in one automated operation. Object Dependency Browser The easy way to explore all objects, objet collections, and dependencies of your Access database. Microsoft introduced a native object dependency viewer in Access2003. ODB goes much further. 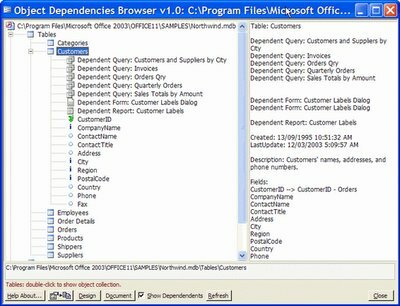 ODB supports Access 97, Access 2000, Access 2002, and Access2003, and all dependency views are integrated into the one treeview. A new version of my MS Access add-in, Ezy Documenter Premium, is now available. Ezy Documenter automatically documents and prints in fully formatted Access reports all the objects in your Access database: tables and fields, table relations, query definitions, forms and record sources, reports and record sources, code modules, macros, data access pages, references, custom command bars, and database properties. The Premium Edition allows user customization of each Ezy Documenter Database Report. Add real-time collaboration to your applications. Get complimentary controls and sample code for incorporating presence and real-time collaboration into line-of-business applications by ordering the free Microsoft Office Live Communications Server Labs and Tools Kit. A new improved version 1.3 of my very popular MS Access tool, 123 Error-Handler Wizard, is now available. The Wizard reviews your database and identifies all procedures without error-handling, and reports the On Error... statement for all other procedures. You select which procedures to add error-handling. The Wizard adds error-handling to the selected procedures in one automated operation. You can also optionally add global error-handling to your database at the same time. In some rare cases depending on the existence of pre-existing error-handlingcode and/or Access incorrectly returning the last line of a procedure, the error-handler was not added to the last procedure in a module. Due to Access incorrectly returning the procedure type for a Function in certain instances, the line "Exit Sub" was inserted instead of "ExitFunction" in the error-handler. SQL Server 2005 Express Edition Overview This MSDN article discusses the integration of SQL Server Express with Visual Studio 2005 and compares this product with the existing free Microsoft databases like MSDE and Jet. The White Paper, Microsoft Office Open XML Formats Guide, provides detailed information on Microsoft Office 12 Open XML Formats, the new XML-based file formats for Microsoft Office Word, Microsoft Office Excel, and Microsoft Office PowerPoint. The new file formats will be made available not only to customers who adopt the next release of Microsoft Office products, but also to customers using previous versions of the Microsoft Office. The Microsoft Office 2003 Security White Paper addresses the most troublesome security threats to Office 2003, and how Microsoft deals with these threats. You can now download a demo of the Ezy Filter PLUS and Ezy Reporter PLUS Data Analysis Pack for Microsoft© Access. Ezy Filter PLUS - Easily filter any data form in any Access database. Ezy Reporter PLUS - Easily create output for any Access database. 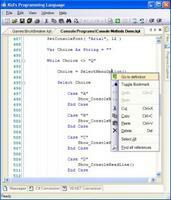 An add code options allows developers to add each tool to their applications. The Future Of Microsoft Office: Office 12 Preview Site During the coming months Microsoft will be announcing new capabilities that will be part of Office 12. Get the latest news and register to get the beta when it's available. Repurpose SharePoint Services Data Using Excel's SpreadsheetML Microsoft has opened up the file formats of Excel and Word through the Microsoft Office 2003 XML Reference Schemas. These schemas free developers from using the Excel and WordObject Models to create documents on the fly and provide anyone with knowledge of XML a powerful method for building reports inside Excel. This article shows how to retrieve data from a SharePoint list to build a formatted report using Excel's XML Schema. Updated Infopath Developer Portal InfoPath 2003 is a new application in the Microsoft Office System for gathering enterprise information in rich, dynamic forms. Learn how to share, re-use, and re-purpose information throughout your team or organization to improve collaboration and decision-making. 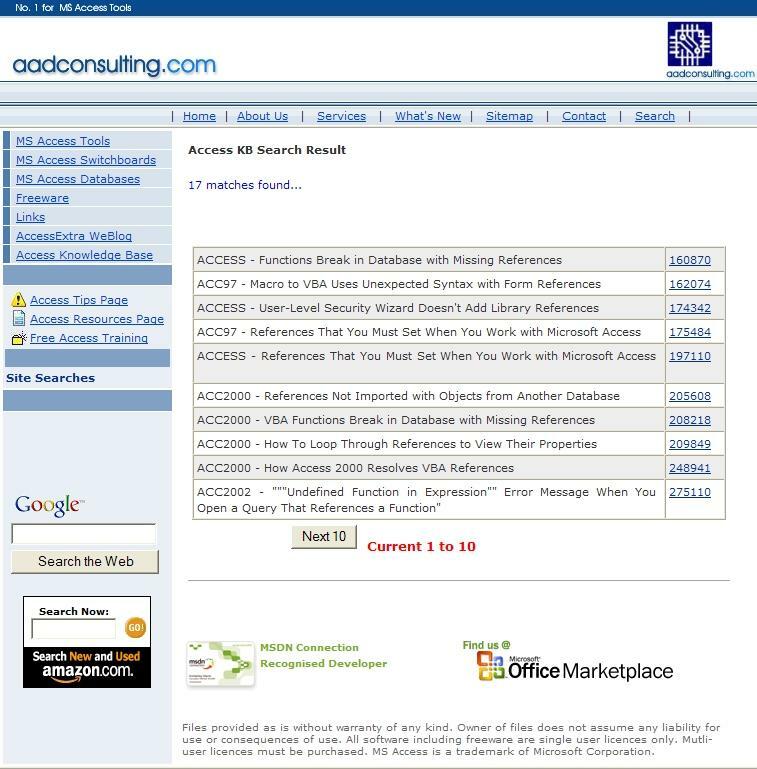 Over 600 Links to MS Access and MS Office Articles, Software, Tools, and Sample Code. Improve the Performance of InfoPath 2003 Forms Avoid performance issues when designing an InfoPath 2003 form template and troubleshoot existing form templates that display poor performance. Download this sample chapter from Microsoft Access 2003 Forms, Reports, and Queries, which discusses various useful methods for controlling report output. Learn about sorting and grouping, adding calculations, launching reports using command buttons and macros, and more. Microsoft Core XML Services (MSXML) 6.0 MSXML6 has improved reliability, security, conformance with the XML 1.0 and XML Schema 1.0 W3C Recommendations, and compatibility with System.Xml 2.0. Visual Studio 2005 Tools for Office Sample: Outlook Business Contact Assistant Sample This download accompanies the MSDN article "Creating an Outlook Business Contact Manager Add-in with Visual Studio Tools for Office"
Visual Studio 2005 Tools for Office Sample: My.Blogs Outlook Sample This download accompanies the MSDN article: "Creating an Outlook My.Blogs Managed Add-in"
Microsoft SQL Server 2005 Enterprise Evaluation Edition Download or order the SQL Server 2005 180-day Trial Software. Microsoft SQL Server 2005 is a data management and analysis solution that enables companies of all sizes to gain greater insight from their business information, apply that insight to enhance their decision-making process, and achieve faster business results for a competitive advantage. A new Express Editions web site has also been launched by Microsoft. The Express Editions are lightweight tools for hobbyists, students, and novice developers who want to build Windows applications, Web sites, and Web services. There are no licensing restrictions for applications built using the Express Editions. Microsoft Office 12 BETA Leaked Microsoft has made the first beta version of Office 12 available to testers, which has been leaked. There are a few torrent files floating around the web. Microsoft Previews Office Live Microsoft will in 2006 launch on-line services that can be used independently but also integrate with Microsoft Office application. Rajesh Jha, General Manager of Information Worker Services at Microsoft says: “A key objective of Office Live is to provide small businesses with the power to easily and inexpensively manage their business in a way that large enterprises already enjoy today. With Office Live services, we make complex technology affordable and easy to use for small businesses, empowering them to reach their business goals.”. The standard package, Office Live Basics, helps a small business establish an online Internet presence including a domain name, a Web site with 30 MB of storage and five Web e-mail accounts at no charge through an advertising-supported model. Office Live also provides a set of subscription-based services with more than 20 business applications to help automate daily business tasks such as project management, sales and collateral management, customer management, expense reports, time and billing management, and secure internal and external collaboration. Built on Windows SharePoint® Services, these applications can be customized and extended to specific customer needs by an extensive Microsoft partner ecosystem. 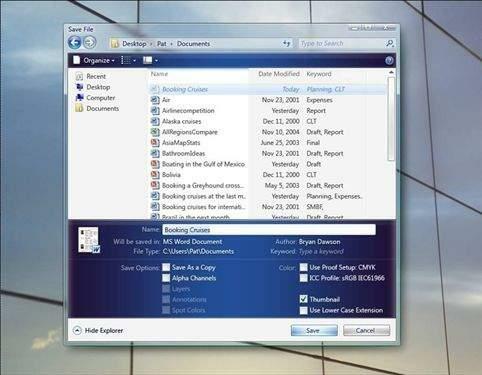 Office Live services initially will be released via an invitation-only beta in the U.S. in early 2006. Small-business customers can sign up at officelive.com. Ezy Filter PLUs and Ezy Reporter PLUS. Easily filter any data form in any Access database. An add code options allows developers to add Ezy Filter to their applications. Easily create output for any Access database. An add code options allows developers to add Ezy Reporter to their applications. Creating Smart Documents with Visual Studio 2005 Visual Studio 2005 Take away the pain of creating smart documents that run inside of Microsoft Office Professional Edition 2003. How the smart document apparatus has been improved inside Visual Studio 2005. Five Things You Must Know About Visual Studio Tools for Office 2005 VSTO 2005 introduces some big concepts, with big implications, like the separation of code from view. It also gives Office application developers some new features and tools to work with, including improved Smart Tags, easy-to-make Actions Panes, and the new Object Test Bench. Learn more by using these code examples to build the ultimate killer app. Easy Time & Billing with SharePoint, Outlook, Excel and VSTO These popular office system applications reduce the pain of recording and reporting your time, with very little code required. Automating the Deployment of an Office InfoPath Form Template Microsoft Office InfoPath 2003 enables you to publish form templates to a specific location, such as a Web server or a network file share. In this article, learn how to update part of a previously-published form template and move it to a new location. 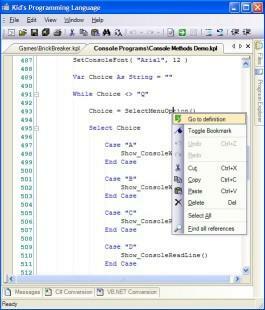 Convert VBA Code to Visual Basic .NET Read this article for a review of the major code conversion issues and the benefits of migrating your VBA code to Visual Basic .NET and Visual Studio 2005 Tools for Office. Create Excel Solutions for Users in More than One Country or Region Learn which issues you should consider when using Visual Studio Tools for Office to create Excel 2003 solutions for end users in more than one country or region. Get the Most from the Office 2003 Primary Interop Assemblies Learn how to get and install the Office 2003 primary interop assemblies (PIAs), and how to reference and troubleshoot them. Create an InfoPath Custom Control Using C# and .NET Check out the InfoPath Team Blog-and learn how to create a custom control that can bind to fields in an InfoPath form using managed code and COM interop. VSTO--Open Forum with Office Team Members Join host Mike Hernandez and members of the Visual Studio Tools for Office team for this open forum. Hear answers to questions that have been on developers' minds. MSDN: Best Practices for Designing InfoPath Forms This popular talk demonstrates the basics and the best practices for designing InfoPath forms. MSDN: Creating Custom Controls for InfoPath Get up to speed quickly as we discuss the steps needed to write an ActiveX control, which works in InfoPath as a custom control. Microsoft Builds Business Intelligence Into Office 12 Availability of Microsoft Office Business Scorecard Manager 2005 and major business intelligence investments in Office 12 will make BI more accessible to employees and valuable to organizations. Office 12: Excel At Your Server As part of Office 12, Microsoft will add the ability to store and manage spreadsheets from a central server, allowing companies to create business rules around how different workers can access the data. 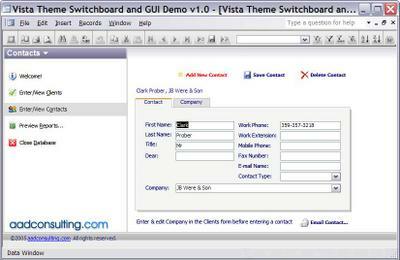 I have just launched my latest Access Switchboard Demo Database featuring Windows Vista-style application navigation. Get the Windows Vista and Office 12 look now! Update for Access 2002 (KB904018) Microsoft has released an update for Microsoft Access 2002. This update removes the functionality in Access 2002 that lets users add new data to or edit existing data in a linked Microsoft Excel worksheet. Office 2003 Add-in: Web Parts and Components Office Web Parts and Components is a collection of Web Parts, Web Part Page solutions, templates, and data retrieval services that work closely with Microsoft Office 2003 and Microsoft Windows SharePoint Services 2.0. Redesigning an Excel VBA Solution to .NET Using Visual Studio 2005 Tools for Office Learn about redesigning an Excel VBA solution to take full advantage of Visual Studio 2005 Tools for Office and the .NET Framework. This article looks at the re-architecture of the Trey Research Internet Information Services (IIS) Log Analyzer solution. 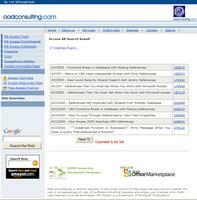 Office COM Add-Ins Find developer information about Microsoft Office applications, servers, and technologies. Use Visual Basic to develop COM Add-Ins for Outlook. IntelliSense XML Files for Visual Studio Tools for Office Developers Adds summary descriptions of types, members, and parameters to IntelliSense ToolTips in code and in the Object Browser for Microsoft Office Word, Microsoft Office Excel, Microsoft Office Outlook, and Microsoft Office Shared PIAs in Microsoft Visual Studio .NET 2003 and Visual Studio 2005. New Product Introduction Process with InfoPath and SharePoint Learn to use an InfoPath form and Windows SharePoint Services to capture new product ideas, route them for review, and then assign a team to get to work. Resume Tracking with InfoPath, Excel, and SharePoint Most organizations use a combination of Microsoft Office documents and e-mail to create informal document tracking processes that require manual updating. This article shows you how to to automate this process. Outlook the Way You Want It—Build Custom Outlook GUIs with WinForms & VSTO Learn to build your own custom form for Outlook appointment items. I have upgraded the on-line Access KB Articles database for direct search results for over 3,000 article links. The search page now supports OR & AND boolean operators. Word 2003: Importing XML Data to Word 2003 Using Visual Studio Tools for Office Download this code sample to learn how to import XML data from a database into Word documents using Visual Studio Tools for Office 2003. 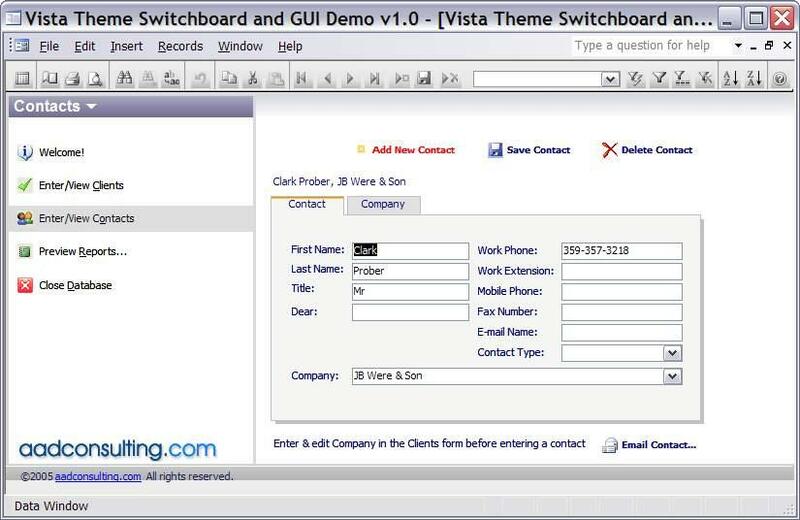 Office COM Add-Ins Use Visual Basic to build COM add-ins and then use them to extend your Outlook applications. These techniques can also be applied to developing COM Add-Ins for Access. Begin Web Part Development in Windows SharePoint Services Introduce yourself to Web Part programming using prewritten Web Parts, Web Part Pages, custom lists and libraries, browser-based editing, FrontPage-based editing, Data Sources, Data Views, Web Part connections, and Microsoft Office connectivity. BETA 2 adds a new dependents of report, after feedback on the first BETA. I have just launched my latest Access Demo Database featuring a new look sidebar application navigation with bonus comprehensive transaction logging code. Morrison Schwarz have also developed a free and really cool development language especially designed to gets kids started in programming. KPL is an easy-to-use VB-like language to make learning to program fun. Download from Kid's Programming Language. Read the wrap on KPL from MSDN's CoolApps on the Coding4Fun portal. I just discovered this excellent resource. Morrison Schwartz offer a wide range of free Developer Tools. FAQ: Looking into Office 12 Here's what you can expect from Microsoft's radical revamp of Office, due next year. Office 12 makeover takes on 'feature creep' Microsoft's radical Office 12 overhaul, due next year, aims to counteract "feature creep" and wake users up to the suite's hidden treasures. Photo gallery: New looks for Vista, Office The September 2005 edition of Microsoft's Professional Developers Conference got under way with a keynote address by Bill Gates and a "live preview" of the next version of Office. Blog: Microsoft Office 12--The rise of smart applications? Find out why TechRepublic's Jason Hiner is ambivalent about Bill Gates' statement at the Professional Developers Conference that Office 12 will attempt to automatically adapt its interface to the type of work that a user is doing. However, he adds, "This makes me think that we may be seeing the beginning of the smart applications of the future--applications that will be able to anticipate and help streamline rudimentary tasks." A 40 minute video demo of the new Office GUI. I have added a new Free Access Training page to aadconsulting.com, with many links to free MS Access and MS Office Training, eBooks, and Book and Tutorial Downloads. There also links to Office, SQL Server, Web Development, VB, and XML material. Instead of the menubar and toolbar, Office 12 users will navigate a new user interface referred to as a ribbon. This new navigation bar consists of a tabbed command bar, which will open galleries in place of the venerable toolbar by hovering over command items. Full review and screenshots. Office "12" XML Schema Reference - PDC 2005 Preview This download contains DRAFT documentation on a selection of Microsoft Office 12 XML Schemas. Video: Brian Jones on New Office XML Format Brian Jones, program manager on the Microsoft Word team, demos the new Office XML format. Automating the Deployment of an Office InfoPath Form Template How to update part of a previously-published form template and move it to a new location, such as a Web server or a network file share. Plenty of MS Office Hype But Where is the Support? For Microsoft's fiscal year ended June 30, the unit that includes Office had operating income of nearly $8 billion, on revenue of $11 billion. The company's overall revenue was $40 billion. It is fair to say that Office is the flagship earnings product for Microsoft, but as an Office developer I feel short-changed. While massive resources and support are available for VB.Net, Visual Studio, and SQL Server, Office Developers get short shrift. Most Office applications are deployed in small businesses and within corporate units, so the fancy but complex and costly-to-maintain enterprise interfaces offered by VSTO and SQL Server are not relevant, yet the support focus is on these enterprise tools. All the talk about supporting Office Developers is just that. At this week's PDC05 the new UI for Office 12 was showcased. A Q&A article on the new design is available at the Office Developer Center on MSDN. In Visual Studio Tools for Office, Windows Forms makes creating a custom control as easy as building a form. From DevX.Com. Visual Studio for Office: MSDN Webcast Forum with MS Office Development Team Explore the new features of Visual Studio 2005 Tools for the Microsoft Office System, such as hosting Word and Excel as full-fledged designers within the Visual Studio development environment, programming directly against data and view objects, and creating a custom Document Actions Pane. Developers can utilize these new features to build solutions that work with the current and upcoming versions of Word and Excel. A simple way to achieve this is to use Excel and Access in MS Office 2002 or Office 2003. Open a blank worksheet and click in cell A1. From the Menubar click Data Import External Data New Web Query. Excel will then prompt you for an Internet connection if you're not already connected. In the Address box, enter the URL of the Web page that contains the stock statistics and then click Go. For example the live stock statistics on the freerealtime.com site are easily linked. Click the yellow boxes with arrows next to the blocks of text you want to import. When clicked, the yellow boxes turn into green boxes with check marks. Right-click a blank area of the main toolbar and select External Data. Click the Data Range Properties button. In the Refresh Control section, select Refresh Data On File Open. Click OK.
Add column headings (ie. field names) to each data column as needed. Now the spreadsheet will automatically update the web data each time the file is opened, or accessed by another Office application such as Access. Select the data you want to copy. From the Menubar click Edit Copy. Click on the cell where you want the snapshot of the data to appear. From the Menubar click Edit Paste Special. Click the Values And Number Formats checkboxes, and then click OK.
Click the Column Widths checkbox and then click OK. In the Link dialog, select Microsoft Excel (*.xls) from the Files of type combobox, and click Link. Follow the the Link Wizard to finish, and you will have a table linked directly to your spreadsheet. Data Access: Let Your Users Sort it Out Develop an MS Access solution that allows users to sort the data in their forms (or subforms) that you can add to your application easily, and along the way, the characteristics of a well-designed module. The Better ZoomBox is invoked by clicking the <...> build button next to each of the above properties in form and report design view. Office 2003 Publication: Office Online Training Courses Quick Reference Cards Content This download provides you with complete text and illustrations of all Quick Reference Cards in Training courses published before May 2005. In the Query Design window, when invoked from within a form's design view in MS Access, you can't go to the Database Window to check the name of an object while designing a parameter query, and as I do, copy and paste the name into the query (using and then cancelling Rename). A workaround is to invoke the Startup dialog by clicking Tools, Startup... from the Menubar, where you can view all forms in database from the Display Form/Page combobox, select the form in the combox, copy the name, and then click Cancel. Role Agent for Microsoft Office Live Communications Server 2005 Role Agent is a sample Microsoft Windows service application that demonstrates the use of the Real-time Communications API 1.3 and Microsoft Office Live Communications Server 2005 to support role-based instant messaging (8/16/2005). Excel 2003 Sample: Populating Worksheets with Multiple Related Records from Windows Forms Use this sample to to display Microsoft Windows Forms from a Microsoft Office Excel 2003 workbook, display related records, and write that information into formatted worksheets. Visual Studio 2005 Tools for Office Beta 2 Sample: Migrating a Word VBA Solution to Visual Basic Using Visual Studio 2005 Tools for Office VBA Migration Case Study based on Microsoft Word 2003, for experienced Office/Visual Basic for Applications developers who are taking their first steps with Visual Studio 2005 Tools for Office. In MS Access 2000 or later, if you're using ADO, there is a way to use ADO wildcards in the Access query design grid. Instead of using the Like operator, use ALike, which also works in SQL statements used in VBA code. MSXML (Microsoft XML Parser) 3.0 Software Development Kit (SDK) The Microsoft® XML Parser (MSXML) 3 SDK includes header and .lib files, and documentation for the MSXML 3 Release. Microsoft XML Parser (MSXML) 3.0 Service Pack 7 (SP7) The Microsoft® XML Parser (MSXML) 3.0 SP7 release offers a number of bug fixes over the previous MSXML 3.0 SP releases. Business Dessktop Deployment Standard Download planning, building, and technical guidance, templates, and scripts to facilitate deployment of Microsoft® Windows® XP Professional and Office Professional Edition 2003.
Business Desktop Deployment Enterprise Download planning, building, and technical guidance, templates, and scripts to facilitate deployment of Microsoft® Windows® XP Professional and Office Professional Edition 2003 through Zero Touch deployment. Office 2003 Sample: Smart Documents Development Overview Learn how to create customized, context-sensitive task panes that interact with XML-based files in Microsoft Office Word 2003 and Microsoft Office Excel 2003. Register for the Microsoft Professional Developers Conference 2005 Join developers at the Microsoft Professional Developers Conference 2005, where the next waves of Microsoft Windows and Microsoft Office System developer capabilities will be unveiled. Use Excel 2003 to Create and Manage Windows SharePoint Services Web Sites How various aspects of Visual Studio 2005 Tools for Office, Excel, and Windows SharePoint Services work together in a hypothetical business scenario. Outlook from the Managed World Get started with building add-ins for Outlook 2003 using the Visual Studio Tools for Office. How to Integrate Flash with Office 2003 Combine the analytical power of Office with the display slickness of Flash. On Demand MS TechNet Webcast: Managing Access Applications Inside an IT Organization Developers and IT organizations face a multitude of challenges in maintaining a healthy Access database ecosystem. Join this session to review tools and strategies for managing shared database applications in multi-user environment. Also discussed are recommended usage scenarios for Access, and when to consider a move to SQL Server, including options available to help make for a successful migration. Office 2003 Add-In: International Character Toolbar This add-in enables you to insert international characters from 26 languages into Microsoft Office 2003 programs. Using the Visual Studio Tools for Office Application Manifest Editor Learn about the application manifest and the process of building the Application Manifest Editor tool, as well as common deployment scenarios supported by this tool.